Save the date: Join us on Saturday December 6th to welcome Santa. Santa will be here from 11-2. Remember your camera and capture the moment with Santa in our beautiful winter wonderland greenhouse. MD Nursery is proud to join other valley businesses in the annual Shop for Schools event. 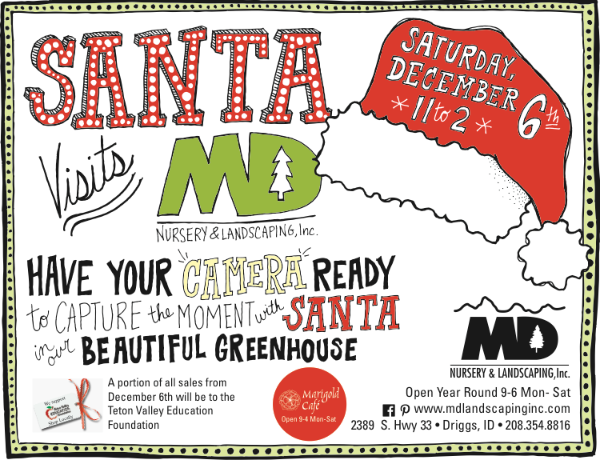 MD will be donating 5% of our sales to The Teton Valley Education Foundation on Saturday December 6th. It’s a great way to contribute to this valuable charity while getting your Christmas shopping done. Can’t decide? A gift card from MD Nursery or Marigold Café is always appreciated! As always, we will gift wrap! Fresh flowers, wreaths and centerpieces will give your home a festive touch this December. We are happy to make custom centerpieces or prepare a gourmet gift basket. Give us a call 208-354-8816 ext 120 to place your order. The gift giving season is here. 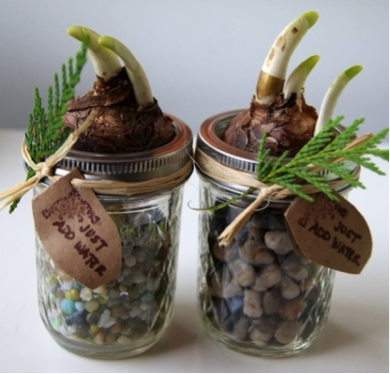 Try making one of these easy gifts for a teacher, co-worker or neighbor. Add a pretty ribbon and a card, and these are good to go! The ever-popular paperwhite is an easy choice for a homemade gift. 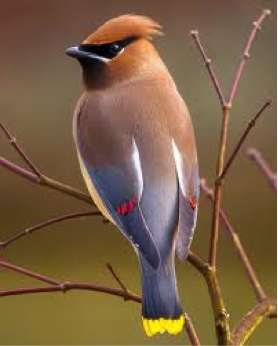 Try planting one in a gravel-filled jam jar, coffee mug or vase. Instruct the recipient to just add water. Wrap with a pretty bow and a little sprig of greenery. Use any clean vase, wine glass or jar and fill part way with clean gravel, sand or pretty rocks. 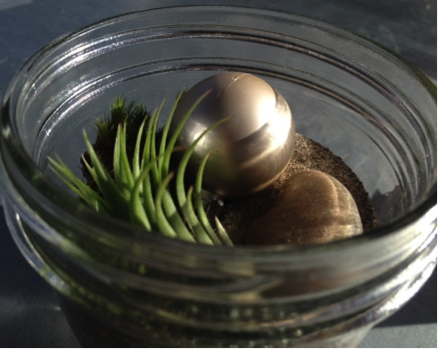 Add some decorative elements like an interesting rock, moss, shell or a small ornament and add one or more air plants to the scene. Add some ribbon and a gift tag and it will be ready for giving. Cachepot is a term derived from the French word cache which means to hide. The goal is to hide the plastic nursery pot within another, more attractive container. Tuck a poinsettia, potted herb, succulent or Christmas cactus into any container that suits your taste or budget. Glazed pottery, baskets, pre-made pot covers or a simple plain terracotta pot will do the trick. A little decorative moss can be used to further hide the nursery pot or cover the soil. 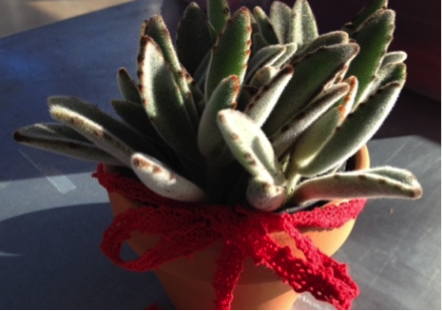 Tie a pretty ribbon around the pot and in an instant, you will have a merry little potted plant. It’s December and we have our annual assortment of seasonal houseplants ready to adorn your home. Here is what you need to know about caring for these seasonal beauties and getting the most out of these special plants. 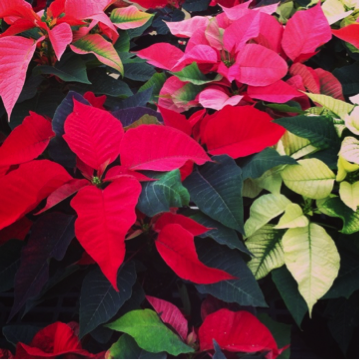 Poinsettias: Keep from cold draughts and heat. Place them in a bright spot. Water only when soil feels dry to the touch. If you are using a foil pot cover, remove it before watering to allow for proper drainage. Christmas cactus: Average room temperature and bright light are all these need. They will tolerate some direct sun. Water thoroughly when completely dry. Norfolk Island Pine: Cool to average room temperature. Mist leaves occasionally. Water sparingly in the winter. Bright to low light. Winter farmer’s market coming to a greenhouse near you! MD Nursery will be hosting Teton Valley’s first ever Winter farmer’s market. The market will be held in our heated greenhouse from 10-2 on the first and third Saturdays of the month from January through March. To be a vendor, click here.